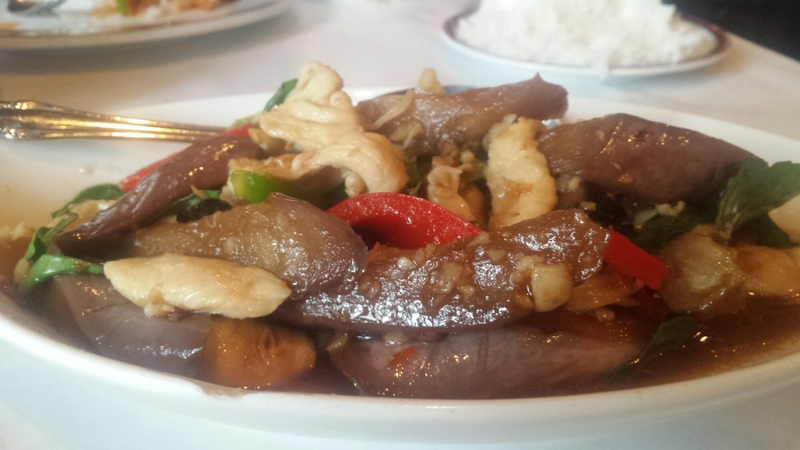 May 8, 2015 ~ Trevis Dampier Sr.
Something about Thai food just makes me smile. The potent flavors and elegant colors in the dishes always brings me into a pleasant internal mindset that eases the nerves. Especially when it comes to a delicious curry dish!! Usually when you hear the word ‘Curry’ you think of Indian food and ridiculously spicy food that makes your eyes balls come out of your head. Those that think your curry must be spicy in order for you to enjoy it are mislead, bamboozled, lead astray, ran a muck, hoodwinged..
You can order curry mild, medium or spicy. If you like spicy foods like me then you should order it ‘medium‘ and that is perfect for the average spice lovers. If you are the foodie that keeps hot sauce in your pocket or purse then you may want to go ahead and go for ‘spicy‘ with your bad self!! Visualize and attack! KrongThai has a great red curry dish called ‘Gaeng Dang‘ and they allow you to add chicken, beef, pork, vegetables or tofu. This means my vegetarian and vegan friends can get their fair share of Thai food as well! The dish has fabulous ingredients of decadence included with it being simmered in red curry paste in coconut milk with sliced bamboo shoots, bell peppers and sweet basils. This is what I plan to inhale today so let the games begin!! Each bite of the chicken and bell peppers just blasts exotic Thai red curry flavors that ignite passion and delicate elegance in your mouth. Every time you swallow it feels like your tongue quivers in excitement. Man this is great!! Next up is a fried catfish red curry dish which they call ‘Gaeng Pla Duk‘. This is a deep fried catfish filet simmered in red curry paste in coconut milk with egg plants, bell peppers and sweet basils. Yum! The catfish batter is perfectly coated and light to the bite with excellent flavor from the curry and each chewing sensation brings you to a place of magnificence. Food so tasty you think you were royalty eating it! True live action eating! Good job KrungThai! If you have never tried Thai food then I suggest you get started. I promise you that you won’t be disappointed! < Previous My Eye starts to Twitch when I need a Cajun Chicken Sandwich Fix! Next > Happy Mother’s Day! Celebrate Mom ‘Extra Lavish’ with this Pecan Crusted Catfish! !